I created this checklist to record the observations of my students during small group sessions/interventions (maximum of 6 students per session). This template is organized in four main sections: Glows, Grows, and Next Steps. In the Glows section, you can check off: Analyzes, Explains Thinking, Correct Operation, Correct Computation, Effort/Motivated, Shows Work. In the Grows section, you can check off: Estimate Solutions, Incorrect Place Value Alignment, Errors in Addition, Errors in Subtraction, Borrowing/Carrying Errors, Errors Subtracting with Zeros, Multiplication/Multiplication Facts Errors, Multi-digit x Multi-digit Multiplication Errors, Division Errors. 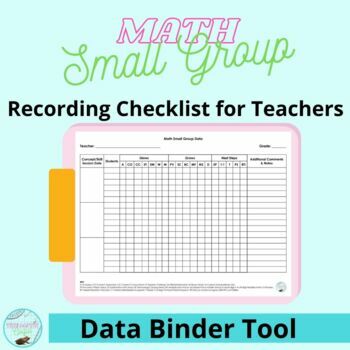 I hope this is as helpful to you as it was for me when recording teacher observation data during small group math sessions!